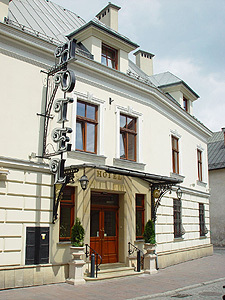 The Hotel situated in the very heart of Cracow's Old Town. The hotel is located in the historical center of Cracow, the Old Polish Capital by "the Royal road", close to the most important attractions of the city. The favourable location of the hotel enables to reach the Main Square within a few minutes. It is possible to do sightseeing among the gothic and baroque churches, museums, the Royal castle and on the Jewish Kazimierz. It is recommendable to visit a lot of cafes, pubs, restaurants and shops. 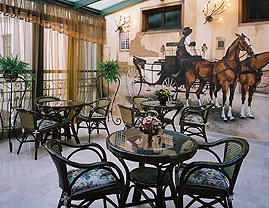 The interesting news is that history of the hotel dates back to the XIX century. However, there is not much remaining from that period, due to fact that it was former the Inn and after accident with fire in 1850, the building was reconstructed and built as National Hotel. The remains of that old hotel resemble the present architectutre. The rooms are air conditioned and equipped with its own bathroom, hairdryer, TV, TV Sat, safe. The restaurant serves dishes of traditional Polish and European cuisine. We prepared for you a conference room for 23 people equipped with audio visual set, whose cost rental isÂ offered at discount rates when food and spending a night is all inclusive. This may be negotiated individually. 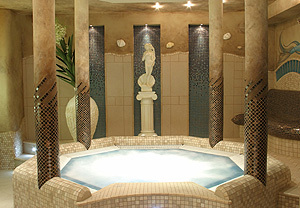 The hotel facilities include: sauna, lift, orangery and garden courtyard in summer. The safe deposit is found in the hotel. The nearest parking is 300 m away from the hotel. The hotel is situated in the city center, 1 km away from the main railway station and 1 km away from the main bus station. The airport is 10 km away.